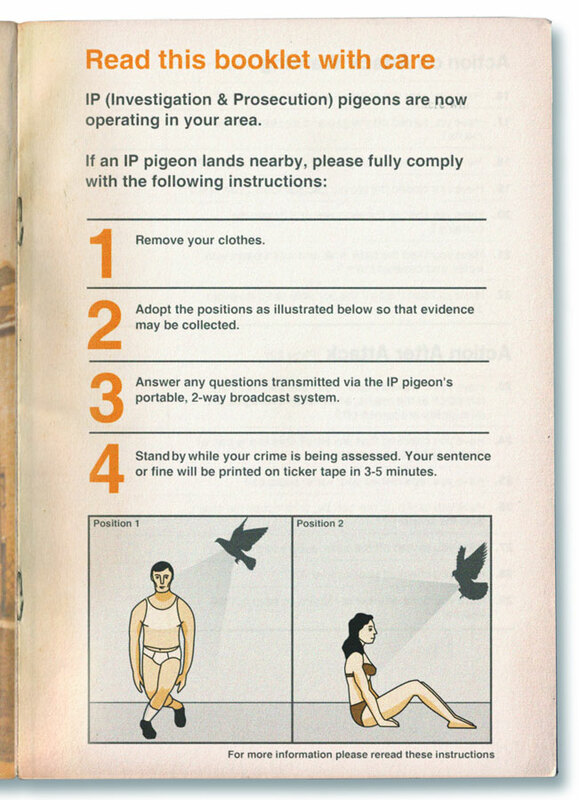 In the 1970s the government realised that more crimes were being committed than was technically possible. This was partly due to the fact that 31% of crimes were fabricated by the government to keep citizens in a constant state of anxiety. To maintain its own credibility, the government banned the use of contraceptives for 3 months per year in the hope that the population would rise and thus generate the citizens required to meet the implausible high crime figures. The scheme backfired when the new population proved to comprise largely blameless, model citizens. However, the government was not convinced of their apparent virtue and created a special, combined investigation & prosecution squad. 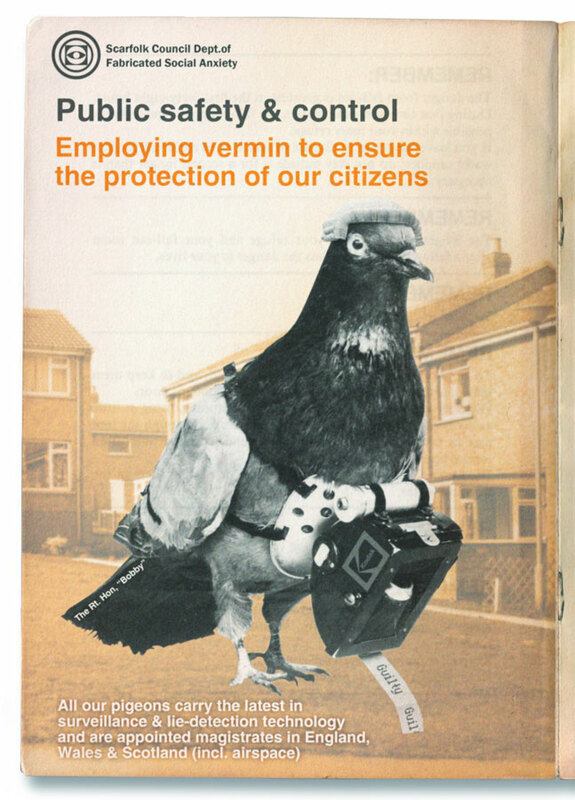 It invested birds, insects and other animals with the full power of a law court and trained them to spy on citizens, assuming that guilt would inevitably be detected. 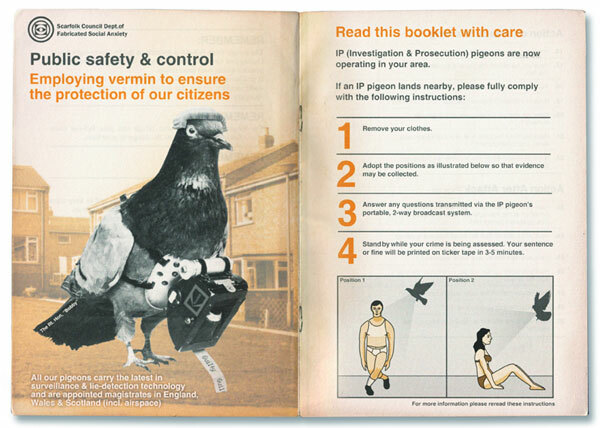 In addition to pigeons (see below), there were crack teams of sparrows, cats, butterflies, stoats and tuna, but there were also 'lone wolf' operatives, the most infamous of which was a ladybird who everyone knew as Two-Spots Bailey, though his real identity remains a mystery to this day. 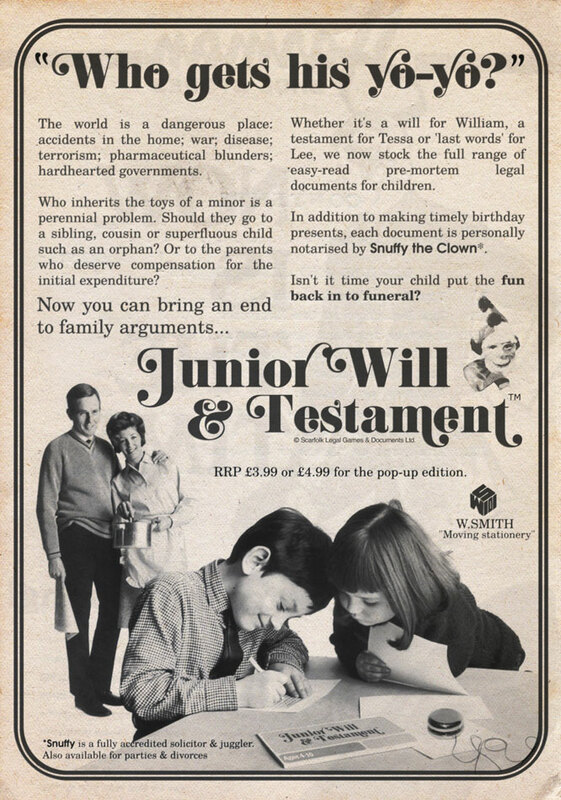 For more about animals being converted into surveillance devices please see the book "Discovering Scarfolk"
'Junior Will & Testament' (see newspaper advertisement below) was produced by Scarfolk Legal Games & Documents Ltd. While it familiarised children with the inevitability of their demises in a fun way, it also introduced them to their civic obligations. For example, many children were not aware that, like adults, they were subject to death duty. Any child who owned more than 20 toys at the time of its passing was expected to part with 26.5% of them; 50% for more than 40 toys. After several years of the 'grave game tax', as it become known colloquially, the council noticed that many of the toys it was receiving in payment were clearly not the children's favourite toys. From then on council workers would audit children every year to make sure that they weren't hiding away their most treasured toys. Particularly untrustworthy were very poorly children. Upon admission into a hospital, the council would confiscate children's possessions until their passing - the council couldn't take the risk that a frightened child may be tempted to withhold a favoured toy during its time of need. In 1979, the millions of collected toys were melted down and made into an enormous, inflatable bouncy castle for politicians to play in on their many days off work.